The heady aroma of lemongrass evokes the tropics and invigorates the senses, and has long been used in cooking and traditional healing throughout Asia and the South Pacific. Strangely, I first encountered lemongrass in a friend’s garden in London and would infuse it in tea, add it to salads and roast vegetables and tie bundles of it around the house for use as an air freshener. In Thailand my love affair began in earnest , I loved the citrus hint in fragrant Thai curries, but best of all were the steam rooms in Thailand and Laos which were filled with the tantalising and intoxicating vapours of lemongrass. When I found myself living in the remote islands of Fiji I discovered that the Fijians planted it around their houses to ward off evil spirits and made special oils from its essence to use on those who had been possessed by devils. Lemongrass has an enticing, lemony perfume without the bite of lemon and its taste is slightly sweeter with just a hint of ginger. It blends well with garlic, chili and cilantro, harmonises with coconut milk and works particularly well with chicken, seafood and vegetarian dishes. Here in Indonesia it often appears in curries and soups as the citrus taste helps to lift richer tasting dishes. A tall tropical grass, the fresh stalks and leaves of lemongrass contain an essential oil with a clean lemon like perfume (similar to that in lemon peel.) The lower portion is sliced or pounded and used in cooking, while the stems can be made to use lemongrass tea (particularly good with ginger and honey). It also makes a flavourful marinade. As well as being a versatile and tasty cooking ingredient, and a natural mosquito repellant, lemongrass has a plethora of medicinal uses. The grass is considered a diuretic, tonic and stimulant which promotes good indigestion and relieves nausea. It can also induce perspiration which cools the body and reduces fever. 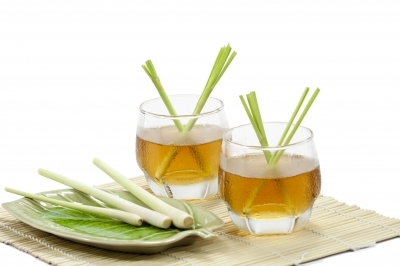 Lemongrass tea combats depression, bad moods and nervous disorders and the oil of lemongrass has anti fungal and anti backterial properties so can be used to treat cuts and scrapes. It is a popular ingredient in massage oil due to its relaxing aroma and it will help sooth lower back pain,sprains, circulatory problems and rhumatism. In ancient times lemongrass was used to repel dragons and serpents and was bathed in to promote lust, fidelity, honesty, strength and purification.Lemongrass tea is believed to aid psychic abilities and divination while carrying a sachet or charm is thought to attract the object of your desire and to bring honesty to your relationships. Whether cooking, healing or practicing magic, lemongrass is best when bought fresh (or better yet, grown in your garden) so be sure to buy ones that have plump bases and long, blade like green leaves. Strip off the tough outer leaves and cut off the bottom root portion. Slice the bulbous end into ring about 1/4 inch in size on a diaganol then bruise the pieces to release the flavour and enter the seductive world of lemongrass. Wash the lemongrass and lime leaves thoroughly to clean the dust and dirt. Place them on a tissue paper so that the water seeps away and they become dry. After the water has drained away from the leaves, chop them with t a knife. Slice the garlic cloves finely and keep them aside. Now take a medium-sized, heavy bottom saucepan and heat the oil. After the oil has heated, reduce the heat and transfer the lemongrass and lime leaves, and allow it to simmer on this heat for about one hour. Once the oil has turned a light green, add the garlic and ginger slices and let it continue to simmer for about 30 more minutes. Turn off the heat and let this mixture stand overnight in the same pan. You can even keep it for a longer period to gain a better, developed flavor. With the help of a strainer, pour this oil into a sanitized glass bottle to store it. Your lemongrass essential oil is now ready for use.